Some of the workshop members are, back: Peter Heim (Elphin Lodge), George Green (Inyoni Creek), Diego Sella (Elphin Lodge), Reg Combrink (Rand Aid Special Projects’ Manager ), Zabeth Zühlsdorff (Rand Aid’s GM services and advance division), Derrick Stroud (Thornhill Manor), Fred Talbot (observer), Roger Matthews (Inyoni Creek) and Vicky Keenan (Thornhill Manor). Front: Tommy Hamilton, Cecil Shainfeld (Elphin Lodge), Mike Britanny (Inyoni Creek) and David Wynne (Elphin Lodge). There is a lot of drilling, soldering and hammering being done by the residents of Rand Aid Association’s various complexes. A huge workshop area has been made available to those men and women who love nothing more than wiling away their leisure time doing metalwork, woodwork and the like. The workshop means that they can carry on with their hobbies without annoying their spouses or neighbours. Already, residents from Inyoni Creek, Thornhill Manor, Elphin Lodge and Tarentaal are making use of the workshop, which is situated at Rand Aid’s central workshops in Lyndhurst. The workshop is already kitted out with a variety of equipment – including radial saws, thickness planers, table saws, pedestal drills, woodworking and metal lathes, moulds, drills and grinders – most of which were donated by residents. “The initial idea came from Phyllis Phillips, the Liaison Manager at Elphin Lodge and Ron Smith Care Centre, who suggested a workshop that would offer residents an alternative to the activities offered by the centre’s occupational therapy (OT) division – which mainly involve arts and crafts,” says Zabeth Zühlsdorff, Rand Aid’s GM Services and Advance division. The idea evolved into a fully-fledged workshop for Rand Aid residents but there are plans in the pipeline to create a smaller workshop space at Ron Smith Care Centre to cater for the less mobile people who live there. Women are welcome too and one of the first workshop members was Thornhill Manor’s Vicky Keenan. A qualified occupational therapist, Vicky is comfortable wielding drills and other workshop equipment and is hard at work creating wooden games to be used to supplement the village’s existing OT programmes. “This is a wonderful initiative,” says Inyoni Creek resident George Green. 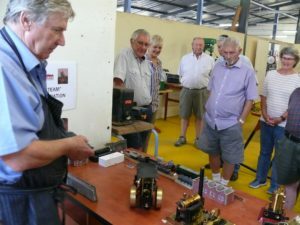 David Wynne, a resident of Elphin Lodge, gave the members of the new Rand Aid workshop a demonstration of his steam and electric model trains. The workshop is likened by residents to Australia’s Men’s Shed – which is an updated version of the shed in the backyard that has long been a part of Australian culture, just as garage workshops are part of South Africa’s culture. 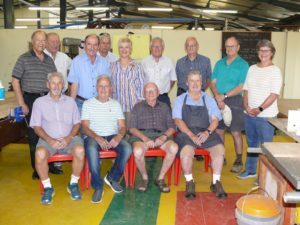 Like the Men’s Shed, the Rand Aid workshop will focus on skills transfer by holding demonstrations and will encourage members to make items for less fortunate members of the community. A comfortable area is also provided so that members can enjoy a cup of tea or coffee and a chat. George is a member of Witwatersrand Woodworkers Association, which makes toys for distribution to orphanages. He says that wooden toys will be made in the workshop to be sold at the various Rand Aid village fetes. Elphin Lodge’s David Wynne makes model railways – both steam and electric – which are wondrous to behold. “My railway experiences started at a very young age peering from my pram through the railings and watching the steam engines at Knaresborough between Harrogate and York in England. I’m sure it influenced my interest in railway modelling,” says the nuclear engineer. “I started making models at the age of seven, then stopped for a while for sport and girls,” he chuckles. A steering committee comprised of residents from across Rand Aid, as well Reg Combrink, Rand Aid’s Special Projects’ Manager, has been established. One of the committee’s main tasks will be maintaining safety protocols so that the workshop is enjoyed safely and responsibly. Steering committee members are Roger Matthews (Inyoni Creek), George Green (Inyoni Creek), Dugald Paterson (Inyoni Creek), David Wynne (Elphin Lodge), Diego Sella (Elphin Lodge), Vicky Keenan (Thornhill Manor), Mike Brittany (Inyoni Creek) and Rand Aid Special Projects’ Manager Reg Combrink.